Every year, as I get older, I begin to dislike the holidays more and more. Don't be mistaken, I love seeing my family, especially the ones I never get to visit with, cooking rich foods that I'm thankful to eat only once a year and relaxing with some cider. Besides that, I can't stand it. Christmas might as well be called Consumer-mas. The material consumption of Christmas drives me completely batty. It gets earlier and earlier each year, too. I'm not a scrooge by any means. I'd rather give my time and love instead of some cheap thoughtless gift. Why buy something for someone on a certain day just because it has become an advertised tradition? I don't buy into it. No pun intended. I'm jumping off my soap box, it is only about 8 am... When I used to go shopping for the holidays, I'd allow myself to stop at a coffee shop when I'd finish. It's hard dodging unhappy families and pushy sales clerks at the mall. 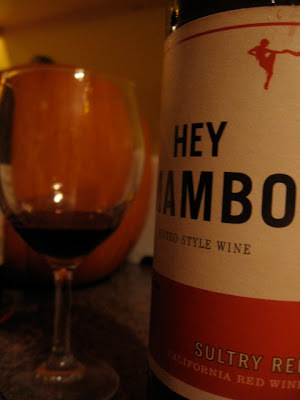 Plus, trying to tune out James Taylor singing Christmas covers makes anyone exhausted! Anyway, more coffee shops have seasonal drinks and snacks; pumpkin, eggnog and peppermint drinks with a tasty pumpkin or chocolate peppermint cookie are quite common. Since I usually can't indulge in baked goods at coffee shops I've become a vegan baking fool at home. And one thing I do get excited about during the holidays is baking and pumpkin creations. I love pumpkin. Pumpkin muffins, scones, brownies, pies, curries, soups, the list could go on and on! It's a versatile fall food that I adore. 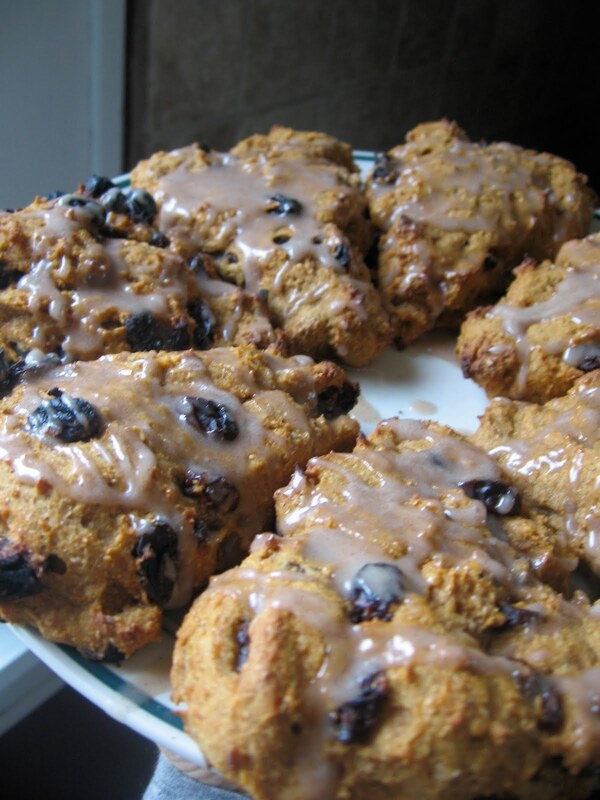 This scone recipe will resemble a scone or muffin you once had at a Starbucks or local coffee joint in your past. I recommend taking your time to sit down with a warm beverage and enjoy each and every bite of this pumpkiny, rasiny, cinnimony goodness. So, get to it! Preheat oven to 450 as you mix the ingredients together. Whisk the dry stuff together and the wet ingredients together. Add all together in one big bowl, stirring in the raisins. Form into triangles, blobs, animals, whatever and place into the oven on a cookie sheet. Bake for about 25 minutes. Stir the cinnamon and sugar together. Slowly add the milk and whisk into a thin paste-like consistency. Drizzle over lightly cooled scones. So if you don't warm up to the consumer-driven holiday like I do, don't worry! There is nothing wrong with you-- maybe with the rest of our culture... But really, making these scones and sharing them with people you love over a cup of coffee or tea will warm your lil' heart and have you smiling. In mid-November when the weather stays crisp and all the leaves have fallen from the trees, I want one thing; Pie. I'm not talkin' about some ordinary pie with an ordinary filling. I'm talkin' about a veggie pot pie full of savory and saucy goodness. Why would you want anything else? As a kid growing up, we'd occasionally have frozen pot-pies that were filled with hydrogenated oils and other indigestible ingredients. True comfort food, right? When I started to become aware of 'things that made you fat' as a teenager, I would refuse to eat them. Even though, I secretly wanted Marie Callander's pot pie recipe so I could make them anytime I damn well pleased. Marie and I never became friends and don't think that we ever will. It wasn't until a few years ago that I started to warm back up to the forever-blacklisted pot pie. Really, it is simple to take a not-so-healthy childhood favorite and make it into a delicious fall meal. Instead of making a huge pot pie, we made individuals. Just like the frozen ones! But better, of course. Since I've rekindled my relationship with pot pies, I've played around with various ways to prepare them. 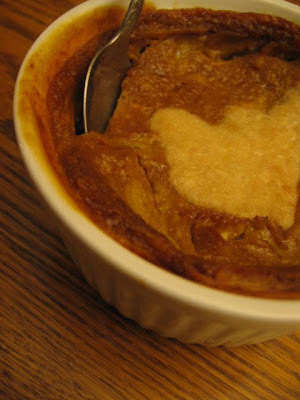 I've tried them with just phyllo dough on the top, prepared a curry pot pie filling, made them in cute ramekin dishes, etc. The variations are endless and a ton of fun. This time, I only put dough at the bottom, omitted the sides and placed dough on the top. It still kept them filling without a ton of extra calories. 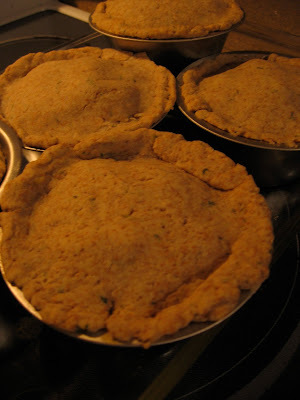 Any pot pie crust recipe or frozen crust thawed and rolled out will work. Saute onion and garlic in pan with olive oil until translucent. Add the rest of the vegetables and continue to saute for about 5 minutes. 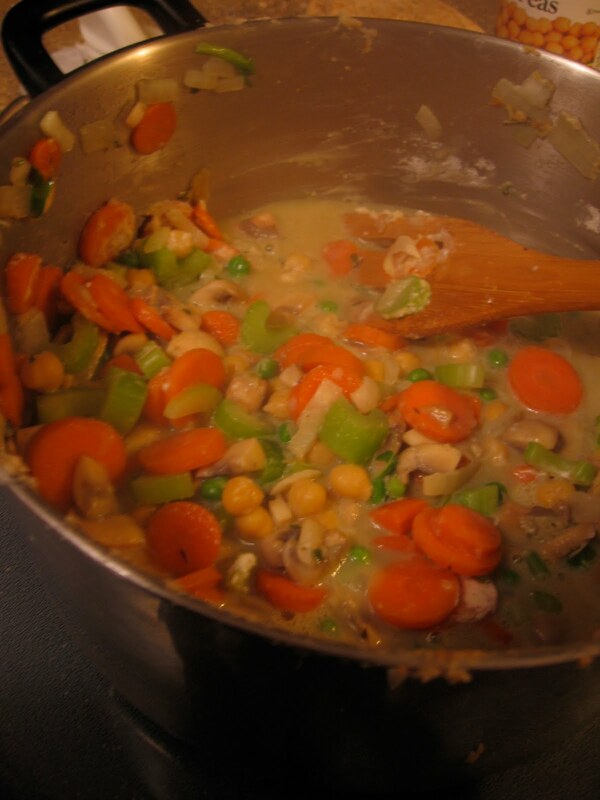 Once the vegetables have brightened in color, add the milk, flour and spices. Let thicken, stirring occasionally. When you're ready, spoon mixture into individual pots. Make the dough and prepare the pans while the pot pie mixture is simmering. Place the dough at the bottom of each pan. Spoon the pot pie mixture into the individual pans and lay a thinly rolled out piece of dough over the mixture creating a completed pie. I promise this pie will satisfy your crew and have them begging for more. They'd be perfect to freeze in individual pans to make any busy night cozy and relaxed. Blugghhhaaaa... I've been studyin' my lil' buns off as the end of the semester approaches. I probably should be studying now or editing some papers, but, I need a break. For me, breaks usually include some of the following- tea, chocolate, screaming, maybe crying or maybe even some dancing. The joys of being a student. When I'm up burnin' the midnight oil I usually start to crave something oh-so sweet and decadent. Something warm, chocolaty, rich and completely delightful to keep my very short attention span attentive. Hot cocoa usually does the trick, but once in a while, I need a flippin' brownie. Ohh yeah, a brownie. I used some leftover tofutti and mixed it with some powdered sugar, vanilla and lemon to make a cream cheese topping. Oh my. To help me stay on top of studying and not eat a whole pan of brownies I found the perfect medium. A brownie baked for one! 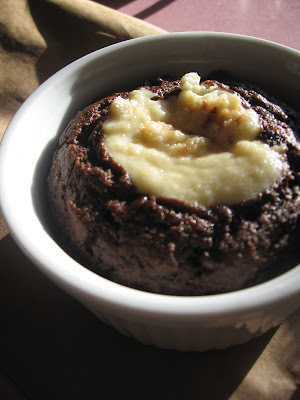 When I need that extra whatev' to keep me focused and studying I rely on Happy Herbivore's single-serving brownie recipe. It's amazing and kinda healthy as brownies go! The recipe makes the perfect amount of brownie and gives a perfect amount of time to put the books down to take a break and enjoy some chocolate! Wether you're living alone and don't want to over indulge in some chocolate, need a break from school, work or whatever, make this recipe! It will put a smile on your face. You might even giggle a bit when you take your first bite! I never really appreciated brussel sprouts until this year and I really like them! Every time I chop them up I always sing the Men at Work song, "Down Under". Why aren't there more Australian bands that sing about Vegimite? My sister and her husband came to visit with their new and adorable dog, Mazie. They adpoted her from a shelter in Madison, Wisconsin. She's come a long way from being a stray to living in a home full of love and squeaky toys. They don't know for sure how old she is, but she still has a lot of 'puppy' energy. Knowing this, I prepared a home cooked meal full of love for all of us to enjoy. I made up some black bean burgers and roasted brussel sprouts from the farmers market. I'm bummed I won't be getting my weekly fix of fresh brussels until next year. Waiting always makes seasonal goods taste so much better and special. Mix 3/4ths of the black beans and brown rice together and place in the food processor. Blend until smooth. Remove from processor and add in remaining beans, rice and other ingredients. When all ingredients are incorporated, form patties. Place on a lightly greased baking sheet into a preheated oven at 350 degrees and bake for 20-30 minutes flipping once. This is Mazie-- I couldn't resist. She is pretty darn cute! Potato wedges + Baker + Baker's Daddy = Hansen's Deli in Green Bay. I really have no business going to Hansen's anymore, but will participate in a walk there. It's only a couple blocks away from my home in GeeB's (Green Bay). Baker is a known around the 'hood and especially at Hansen's. It's probably one of his favorite places to go to and depending on who is working, he's allowed inside. He and his Pop have gotten into the habit of sharing ice cream and potato wedges on their walk home. I'm not particularly in favor of this - it's unhealthy and they form this alliance against me. It makes my treats unappealing to young Baker, "Not another carrot, Muma. Pleeeassee?" Actually, Baker frickin' loves carrots. I once came home to a bag half full of carrots. Some how the lil' guy, without thumbs, opened up a bag of mini-carrots and ate them. Anyway, to make a healthier option for the whole family to enjoy, I made some dickity-dank wedges that everyone can agree on. I promise your family will love these and not miss the greasy-fatty taste of any alternative. 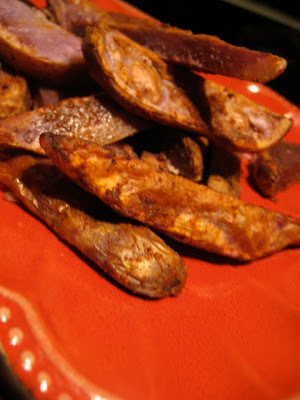 Pick out any potato that bakes well- yams or sweet potatoes work, too. 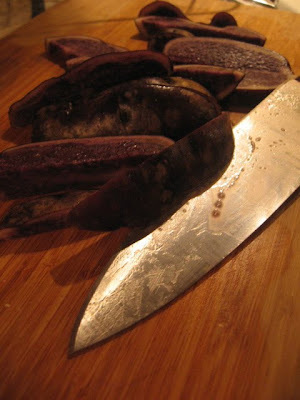 I used Purple Peruvian Potatoes that I bought at the farmer's market. I had never used them before. They make for a fun and colorful side dish, for sure! They're not too starchy and baked well as wedges! purple potato inkblot... what do you see? Chop potatoes (I used 5) into wedges while the oven preheats to 450 degrees. Place potatoes into a ziplock bag. Drizzle 3-4 tablespoons of oil into the bag to coat the potatoes. Add 3 tablespoons cornstarch and any spices you'd like. We like things pretty spicy so I used 1 tablespoon cayenne pepper, 1 large teaspoon of garlic powder, 1 1/2 teaspoon crushed red pepper and salt n' pep to taste. Coat the potatoes with spice mixture evenly and place onto a baking sheet. Bake for about 30-40 minutes. Enjoy! In all seriousness, there is something magical about Pumpkin Pie; not just a lame title for my post. 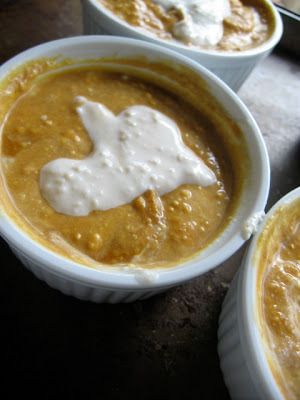 It was always a childhood favorite and I still enjoy baking and cooking with pumpkin. 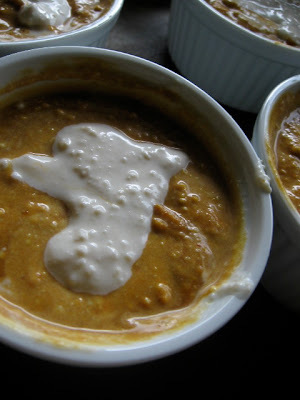 I even incorporate it into curries, potpies and other favorite fall dishes. But, my favorite will always be pie. A true classic. Who could resist the texture, the spices, the warm-fuzzy feeling after eating the first bite. Awhh, yes! Pumpkin Pie, you are so magical! These individual pumpkin pots might not look as "magical" as I hyped them up to be, but their taste is superb and I guarantee a warm fuzzy feeling upon ingesting. I had leftover cream cheese filling since I placed the pumpkin/cheesecake mixture into individual ramekins. So when life gives you extra cheesecake mixture, make ghosts! I tried to make ghosts on top of the pumpkin. Some turned out great and some look just like blobs. It was fun and my guests thought it was a cute idea! I'll try to get a turkey outline down by the 26th!